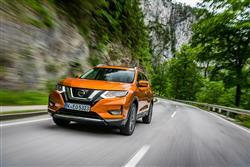 The X-Trail is a big deal for Nissan, the brand's best-selling model worldwide. Here, we're looking at an updated version of the third generation model which continues to offer space for up to seven, some seriously smart technology under the skin and an updated range of powertrains that sees buyers choosing from new 1.3-litre petrol and 1.7-litre diesel units. As before, there's also reasonable off road capability if you want it in a model line positioned just above the popular Qashqai, offering Crossover aesthetics with proper SUV mechanicals. 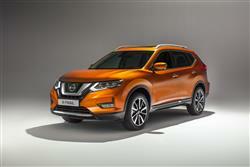 The Nissan X-Trail story to date is a bit of an unusual three-parter. The first model appeared in 2001 and was sold as a 'lifestyle' SUV. Or rather it would have been if we Brits had bought any. Instead we rather blanked this excellent car in favour of Land Rover Freelanders, Honda CR-Vs and Toyota RAV4s. Undeterred, Nissan tried again, with an all-new car in 2007. Now the tack had slightly changed. The X-Trail looked much the same, but it was now marketed as a more serious 4x4, with proper off-road ability. Although the quality inside had improved markedly, it still never caught the public's imagination quite like its little brother, the Qashqai. The X-Trail got a wash and wipe in 2010 but it was just to tide customers over ahead of what we see here. The current X-Trail was launched in 2014 and ditched the Bear Grylls image, instead taking inspiration from Nissan's market-leading crossovers - the Qashqai and the Juke. It's this design that Nissan updated in mid-2017 to create the car we're looking at here. Under the bonnet, the core engine is now a perky but frugal 1.7-litre dCi 150 diesel, available with either 2WD or 4WD and a 6-speed manual gearbox. This unit delivers plenty of pulling power (340Nm of torque) and is decently refined, so should be at home on or off the beaten track. Alternatively, buyers can opt for a 160PS 1.3-litre DIG-T green-pump-fuelled powerplant that comes only with 2WD and which must be mated to DCT automatic transmission. 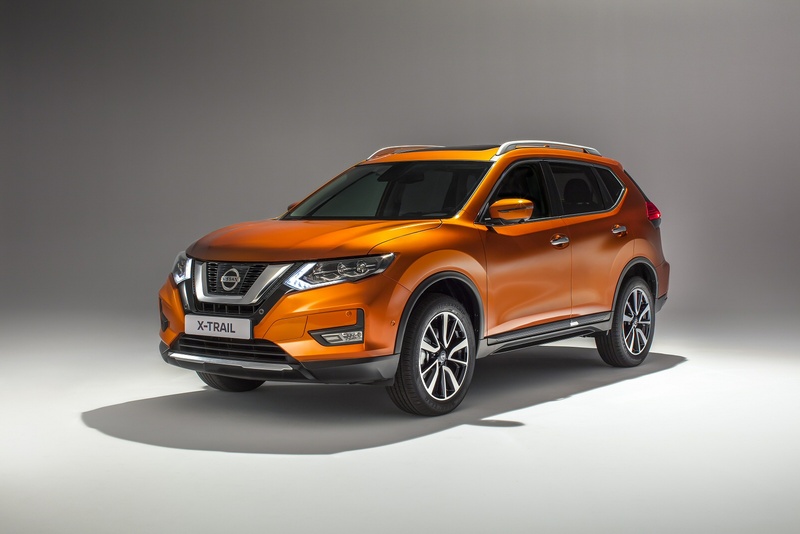 Although the X-Trail appears to have become a bit more lifestyle oriented in recent times, this is Nissan we're talking of here; manufacturers of some of the cleverest all-wheel drive systems around. They just can't help themselves. The top diesel variant's electronic four-wheel drive system, ALL MODE 4x4i, is controlled via a rotary switch on the centre console. It offers a choice between two-wheel drive, Auto mode or Lock offering permanent four-wheel drive. So far, so conventional. 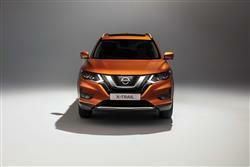 The X-Trail also features Active Ride Control and Active Engine Brake. Active Ride Control monitors the road surface to detect undulations which could potentially upset the pitch of the car body and alters the damping to compensate. Active Engine Brake meanwhile, harnesses the power and controllability of the Xtronic transmission to add a degree of engine braking while cornering or when decelerating to a standstill. Then there's Active Trace Control. By using on board sensors to monitor speed, steering angle, throttle opening and braking effort, Active Trace Control brakes wheels individually, as required, to reduce understeer and help the driver steer a safer path through bends: it is particularly effective on slippery, wet roads. 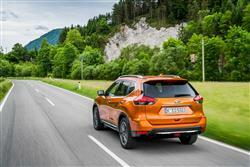 Finally the X-Trail benefits from Uphill Start Support and Advance Hill Descent Control. This Nissan has always been noted for its sculpted and muscular styling, with chiselled lines, high wheel arches and rather elegant curves on the bonnet. All of those characteristics remain, but since the 2017 re-style have been complemented by a more distinctive front end that showcases the brand's 'V-motion' grille, flanked by sleek headlamps that feature full-LED beams on upper-spec models. At the rear, the bumper features chrome detailing, plus there are also chrome side mouldings on the doors. Inside, there's a smart D-shaped steering wheel with a wide rim, plus various trimming embellishments to give a high quality cabin feel. The tailgate can be ordered with gesture-controlled power operation. As usual on an X-Trail, there's the option of third row seating if you want it: most X-Trail customers do. Practical touches include rear side doors that open to almost 80 degrees - far wider than normal - to allow not just easy access but also to ease the loading and unloading of a child seat. The middle row seats recline and slide while, where fitted, the third row folds forward to increase luggage space. Helpful touches include, for example, a large between-the-seats console box. The box itself is large enough to take an iPad or 10-inch tablet. The luggage bay can be portioned into upper and lower areas in a simple single-handed move. In its topmost position, a dividing board can hold up to 10 kilograms of luggage, or 75 kilograms in its lower position. This split cargo solution enables the user to store, for example, a stroller and large items below while creating a fully usable upper load surface for smaller, lighter items. As before, prices sit in the £25,000 to £34,000 bracket and there's the option of five or seven seats and, on the diesel, two or four-wheel drive. The dCi comes only as a manual. The petrol version comes only as a 2WD DCT auto. As ever, the familiar trim grades are Visia, Acenta, Acenta Premium, N-Connecta and Tekna. All trim levels feature air-conditioning, alloy wheels and six airbags, LED daytime running lights, five-inch colour combimeter display, Bluetooth with microphone, cruise control and speed limiter. Hill start assist, follow me home lights and a luggage board system are also among the features fitted as standard. 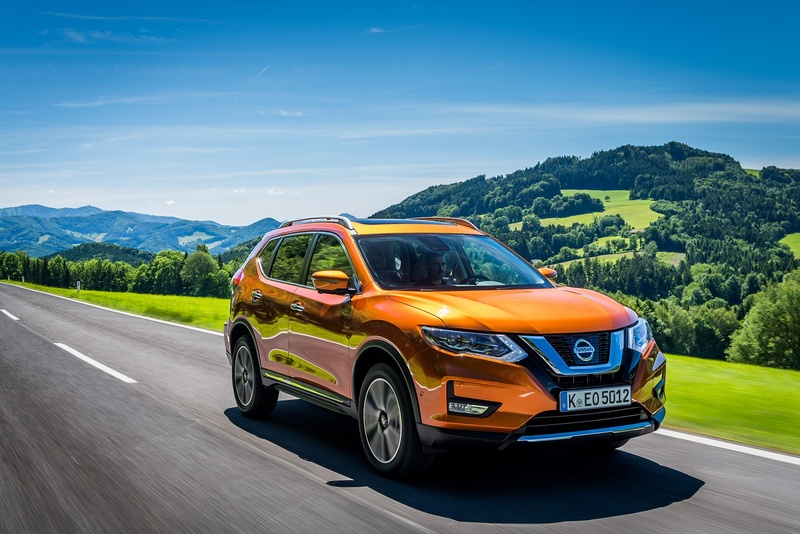 Range-topping Tekna models feature an array of technologies that further confirm Nissan's lead in the crossover market. These include LED headlamps, leather seats, electrically-adjustable driver's seat, front and rear parking sensors and 19-inch alloy wheels. In addition, Tekna models also feature a new BOSE audio system, along with the brand's 'Intelligent key with engine start button' system. 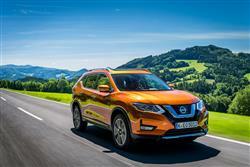 Camera-driven safety technology has taken a step forward with Nissan's 'ProPILOT' package. This combines three systems - Lane Keep Assist (LKA), Intelligent Cruise Control (ICC) and Traffic Jam Pilot (TJP). It's supposed to be the first stage on the brand's journey to autonomous driving, giving drivers more freedom by allowing them to automate the mundane elements of their motoring life. The core dCi 150 unit is a reasonably efficient choice. Offered with the option of two or four-wheel-drive, two-wheel drive models enjoy NEDC CO2 emissions of up to 137g/km and up to 43.5mpg of combined cycle WLTP economy. All-wheel drive diesel models equipped with Nissan's ALL MODE 4x4-I transmission emit up to 151g/km and manage up to 42.2mpg. For the 1.3 DIG-T petrol auto 2WD model, the figures are up to 145g/km and up to 34.9mpg. To achieve these readings, Nissan's engineers did more than just work on the efficiency and performance of the engine and transmission. By reducing weight and optimising the car's aerodynamics, the engineers have been able to make the X-Trail very efficient. Numerous features have been introduced to counteract the increase in size of this generation model. For example, the tailgate is constructed largely of plastic. 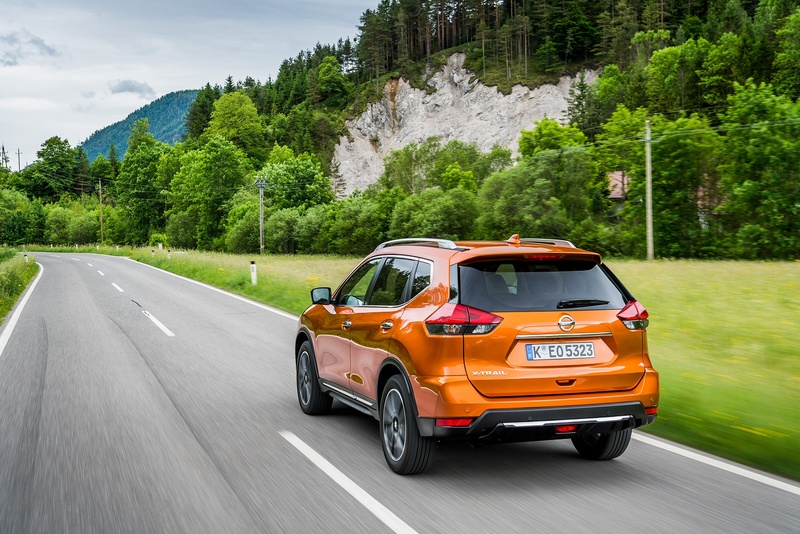 Aero-friendly door mirrors and an underfloor spoiler that covers the exhaust and rear panel also play their part in making this X-Trail very efficient. 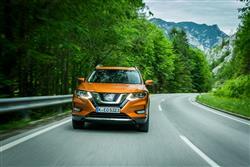 If you�re looking for a new Nissan X-Trail 1.6 DiG-T Acenta 5dr Petrol Station Wagon for sale, you�ve come to the right place. At Bristol Street Motors we don�t just have the best Nissan X-Trail 1.6 DiG-T Acenta 5dr Petrol Station Wagon deals, we also offer friendly advice and help with all your enquiries to ensure your buying experience is a happy experience.